Origin and Habitat: Bolivia (Tarija, Potosí, Chuquisaca) and Argentina (Salta, Jujuy). Altitude range: 3000-4000 metres above sea level. Habitat and ecology: Rebutia atrovirens occurs on rocky outcrops among grass with very low bushes often on steeply sloping ground where water rarely stands for any length of time. 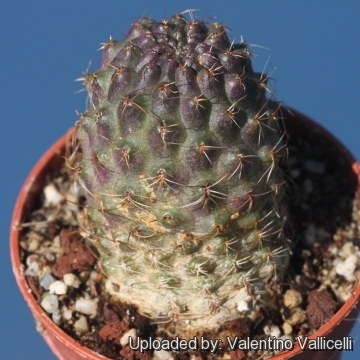 Description: Rebutia atrovirens (firstly described as Lobivia atrovirens by Backeberg in 1936) is a local or morphological form of the widespread and variable Rebutia pygmaea. It has a shining, dark green, tuberculate body with a dull violet shimmer and very dark red flowers. 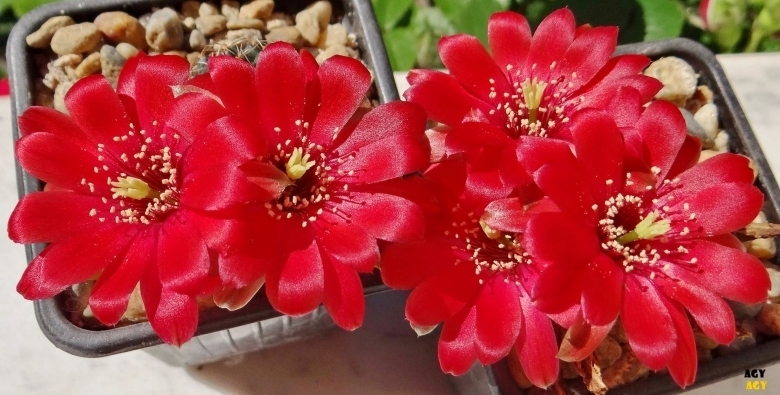 However the distinguishing characteristics of Rebutia atrovirens, appear to fall within the natural variation of Rebutia pygmaea and it should be synonymized with the latter. Cultivation and Propagation: Rebutia atrovirens is a summer growing species that is easy to cultivate and recommended for beginners. The whole Rebutia pygmaea complex has delightful flowers and the plants remain compact, and clumps can easily be managed by division. Another advantage is that the plants are very cold hardy in Winter if kept dry. Pests & diseases: It may be attractive to and liable to damage by spider mites and thrips but plants in good condition should be nearly pest-free, particularly if they are grown in a mineral potting-mix, with good exposure and ventilation.